For any readers missing the argument for a left exit vote in the coming referendum, here’s one I prepared earlier. In the EU’s rush to take austerity positions since 2008, the budget mechanisms of the EU have been reimagined and the Commission and the ECB have become devices for forcing cuts on the poorer European states. It is a condition of continued membership that budgets are submitted to the EU each year and there they are scrutinised to ensure a continuous process of cuts, privatisation and diminished collective bargaining. In Ireland, Greece and Spain, EU policies are leading to a rapid diminution of union bargaining, and if these are the worst affected, the direction of travel is the same all across the continent. That said, while I can recognise that the left exit position can have a principled basis, it’s problem if anything is that it is too principled. I have yet to encounter a left exit argument which finds a transmission mechanism between the high socialist hopes of those that I hear espousing exit and the vote. Why, I want friends to explain, will an exit vote improve the balance of forces for the left in Britain? The vote is / the vote isn’t a vote for restricted immigration. If you study the polls carefully, I understand it is possible to construct an argument that the EU exit vote isn’t just about immigration. When people are asked to explain why they are voting for exit, they do not always put immigration as their sole or even necessarily their top priority. Now one (relatively weak) response would be that data on voting intentions often has this character: if you study people’s reasons for UKIP voting, say, often people have complex and conflicting reasons for voting the way they do. More important, is an understanding of how the national exit vote has been planned. The strategists of the exit vote are aware that: i) they have a big lead among the demographics most likely to vote (i.e. 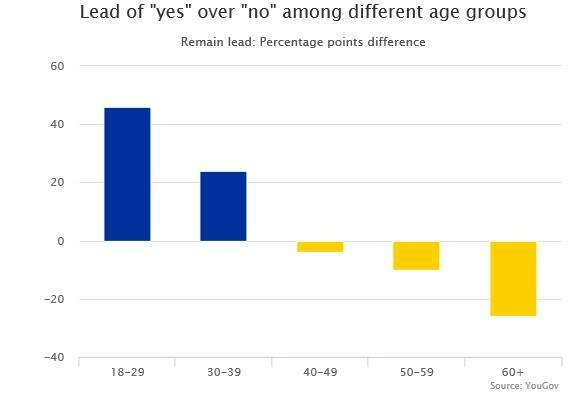 over 65s – see graph at top), ii) there is an equally big stay majority among the groups of people least likely to vote (i.e. under 25s), iii) these majorities have different weight. Because over-65s are much more likely to vote (in general and in this case in particular), exit can win without a popular mobilisation, in fact the more that it polarises people the greater the risk that today’s possibly-non-voting stay voters will be converted into tomorrow’s actual stay voters, iv) therefore anything that feels like racism is counterproductive – the UKIP/migration vote is already primed and ready to vote (of all the parties, UKIP supporters report the greatest interest in the referendum and the greatest intention to vote). Raw anti-migrant politics will only produce a reaction in terms of stay voting by the young. This, I think, explains the way that the exit argument is positioned both in the national media and locally. There is a constant shuffle backwards and forwards between “immigration” and “other” arguments. One day, we are told that the NHS is dying under the weight of prospective immigrants, the next day that migrants are dragging British workers into poverty. Then as soon as these arguments are put, they are withdrawn and replaced with a blancmange of emptiness which is the characteristic mode of the exit argument. It is the same with the local literature: for every letter you find in which exit is presented in terms that would make a BNP voter smile, there are two fliers in which the No campaign avoids text and slogans and limits itself to stating that there is an Exit position, the politics of which are already assumed. That said, while you can make an honest argument that Exit politics have been “less horribly anti-migrant” than many on the left predicted; you can’t make a compelling case that any significant part of the exit argument in this referendum has been an argument for redistribution, unionisation or socialism. Who gets to interpret the meaning of a large Exit vote. Imagine a different context: a Labour government is elected, led by Jeremy Corbyn. The government has widespread popular backing and introduces a programme of nationalisations. Some EU institution (the ECJ? – it would only get involved as a result of a legal process starting in the UK, so we are planing already a two-term Labour government) announces that the EU which has previously allowed such nationalisations as Northern Rock now no longer approves of them. Corbyn calls a referendum to leave the EU in order to deepen his reform plans. Here, I’m not making the obvious point that “this isn’t how we got here” but a (slightly) subtler one. In a democracy, the people who get to interpret a popular vote are the government of the day. Under a Corbyn government the left decides what a vote means, under a Tory government it’s the Tories who choose. A 55-45 exit vote will be interpreted as a the greatest possible popular affirmation of the politics of the Tory right and UKIP in just the same way that a stay vote will be used to bolster Cameron, Osborne and also (although to a lesser extent) Corbyn. So, while the left exiters might want to interpret a 55-45 vote in “their” favour as an argument for socialism, that’s not how it will be interpreted by the government, and therefore by Parliament in the making of new legislation, or by the members of the main parties. Let alone by trade unionists, migrant workers or the young. (All three of whom have good reasons to fear an exit vote). In all these different constituencies, the dominant interpretation of an exit vote will be a vote for faster neoliberalism, the greater unpicking of reforms, faster privatisation, etc. Who is actually voting. I’ve alluded to these points already, but to bring them out more clearly. The exit vote corresponds exactly to the demographic of the people who consistently vote for the worst political options in Britain: above all, it is an age vote. In just the same way that Miliband was ahead among the young and lost in every age group above 40, so it is with the exit vote. It is the vote of the old, of UKIP and the worst Tories. Friends on the left shouldn’t tell themselves that you can mobilise the very people in society who are most opposed to you, on their favoured issue, in circumstances they have been preparing for 30 years, with their government is in power and expect anything good to result. All of this is relevant not merely to how people should vote but what the effect of a large exit vote will be. We live in a society that has for four decades increasingly criminalised migration, and in which non-EU citizens resident in Britain have been denied the vote in the referendum that will decide their future. It is already the case that such non-EU migration as the UK still allows overwhelmingly comes as a result of EU law. Both EU and non-EU citizens will find it harder to come to Britain in the event of an exit vote and harder to stay. A large exit vote is going to mean an attack on EU migrants – if the left is seen to have voted for that attack we will be in a weaker position to resist it afterwards. My own view remains that this is a referendum that the left cannot win and that either option will result in further attacks. Yet in the choice between two bad options, one of them is worse. Interesting re: polling. I’ve been following rs21’s coverage of the issue and was shocked to find out via some testy comment exchanges that the U.K. isn’t part of Schengen (as an American I had no idea that the U.K. has a special set of legal arrangements for immigrants and travelers). I think you make a compelling case that a vote in favor of Brexit will be taken by society at large to mean a triumph for UKIP and immigrant-bashers but what would Brexit mean from a legal standpoint for immigrants and travelers? What would objectively change (regardless of how anyone spins it or how popular consciousness reacts)? I haven’t seen much discussion of the objective aspect of what would change anywhere on far left sites and I think we should try to get our heads around what the objectively result of a Brexit vote would be first before approaching the difficult question of what the subjective result would be. I’m not familiar with what the current arrangements are much less what they’re referring to re: Canada? Present rules are that in principle any citizen of any EU state is entitled to migrate to the UK after which they are entitled to full rights to work / full benefits (there is a partial exception for citizens of states which have recently joined the EU). So if a French person is treated worse in Britain than a British person in terms of her ability to enter or leave the country or her access to employment or housing or any other service, that is unlawful discrimination and she can sue. (It would be like if the free trade agreement in North America meant that a Mexican citizen was lawfully entitled to the same rights as a citizen of the US in America and a Canadian in Canada – all visa restrictions, any employment bars have come down). As for the Canadian model the idea is that Canada has been seeking to sign off a trade agreement with the EU since 2009. And it “may” be that this gives Canadians “some” rights to enter or live in the EU. That’s a model. Another model is the various non-EU European states which have open borders and free trade with the EU: the price of this is that they subsidise the EU financially, are subject to EU laws and have no say in the making of those laws (it’s hard to see a UK government, post a Brexit vote, being willing to negotiate some equally unfavourable treaty: It would mean all the responsibilities we have at the moment without even what Brexiters consider the limited advantages). “In a democracy, the people who get to interpret a popular vote are the government of the day.” In a democracy, that’s true, until the voters decide to change the government. I assume the comment about the argument for Lexit being ‘too principled’ means you don’t think that you could ever win a popular mandate for your favoured politics, in other words, you don’t really believe in popular sovereignty, or democracy. This piece goes to the heart of the dilemma some anarchists are experiencing, which stems from the confusion between the balance of revolutionary opportunities, and the likely balance of political forces – the relative fortunes of parties and personalities. The latter is not something we should concern ourselves with. It’s all part of the ‘society of the spectacle’! I have a feeling, the government are manipulating very cleverly, an out vote. The gov want us to be isolated, and the public ever more vulnerable to our totalitarian state. I reckon, in view of confusion, there will be a low turn out say 40% max, and the usual propaganda that the ins have majority, so less ins turn out. And then the outs, buoyed by Boris, who is set for next PM, will win, and if will look as usual, as if public won and Cam /Osbourne out, which is as they want. All very strategic for control and winning next election. In that case – because of what was at stake, because of how the dynamics of the campaign played out, the meaning of an independence vote changed. And the independence vote became certainly an anti-neoliberal vote and perhaps even an opportunity to make revolutionary propaganda (using the same categories as Wessex Solidarity’s post elsewhere on this wall). This *hasn’t* happened in the present Exit vote and in the next four weeks *won’t* – because of the people voting, the nature of the issue, and the principal justifications given for it (ie that exit will stop free migration from Europe, and that exit will make it easier for business to employ people more cheaply without those unwanted European laws). The nature of the Exit campaign means that, by definition, workers and EU migrants aren’t going to join the Exit campaign en masse; and without them the anti-EU camp feels like Cameron’s twin, not his antagonist. What they have been trying to manipulate is not so much a false flag, but a situation in which either vote leaves them still in control. Good post and I agree much with your analysis here (except that since you wrote this, Exit politics have become more ‘horribly anti-migrant’ rather than less). You’ve hit the nail on the head by saying the left exit position is too principled. To me what both the hard left and hard right arguments for Brexit (despite differing in almost every other respect – not least in that the hard right will actually have a chance to implement it) have in common is that they both choose to prioritise a game of ideological purity over the very real negative consequences that we know Brexit would have for real people. Personally I find that irresponsible.